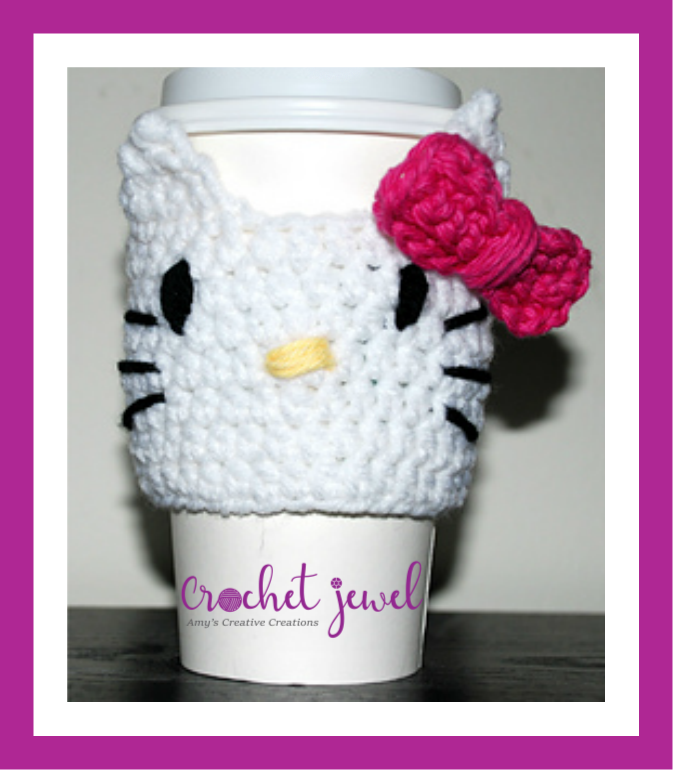 Create a Crochet Kitty Cup Cozy for you Morning Coffee! I used this Crochet Cup Cozy on a Starbucks cup. H hook, white, pink, yellow, and black yarn. Ears: H hook, white yarn, Rnd 1. sl st with white yarn at the top of the cup cozy. sl st 15 stitches from the beginning stitch. Rnd 7. 2sctog decrease, turn -1sc. fasten off, weave in the ends. The next ear, skip 3 stitches, sl stitch with the white yarn, and Repeat Round 1-7 as above for the next ear. fasten off. Eyes: With yarn needle, black yarn, sew in 3 vertical lines about 1 inch long, Make two, about 2 inches apart. Nose: Black yarn, with a yarn needle, sew in the 4 horizontal lines about 1 inch long. rows 2-4. *sc in each ch across working in the back loops only, ch 1, turn, *repeat, sc in all stitches around the border of the bow. take yarn and wrap it around the center of the bow 6-8 times or so to make the center of the bow, secure and attach to the left ear.